(1) Extremists: A recent Washington Post poll showed that a sizable majority of Americans agree that Republicans should "take away federal funding" to block the implantation of Obama's unpopular executive amnesty. Senate Democrats are ignoring the will of the American people in order to protect a presidential action that under-cuts the Constitutional balance of powers. (2) Obstructionists: Mitch McConnell's majority, duly elected by the American people, favor this legislation -- even if they'd like to offer some tweaks and alterations. 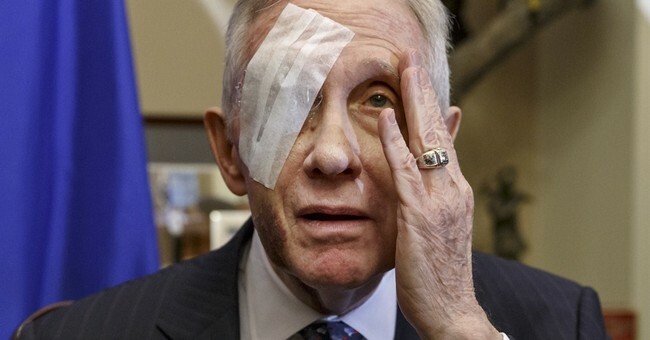 Harry Reid's crew is blocking that process from even beginning. Reid's militant opposition to allowing the US Senate to vote on things, as both the majority and minority leader, is officially legendary. (3) Hostage-Takers: Senate Democrats are willing to threaten national security funding (as they so often put it) in order to shield Obama's illegal fiat that halts deportations and issue work permits to millions of illegal immigrants. House Republicans have passed a bill that extend all DHS appropriations, with this very narrow and appropriate exception. Senate Republicans would like to debate and vote on that bill. Democrats won't allow discussion, let alone, amendments, out of slavish fealty to a president whose agenda was just roundly rejected by voters. Why are Senate Democrats endangering American children's lives? (4) Pro-Shutdown Fanatics: As a result of Senate Democrats' nihilistic hostage-taking, they are effectively endorsing a government shutdown, subordinating citizens' safety to their reckless ideology. And because Senate Democrats unanimously backed this obstructionist filibuster, it's clear that they're now taking their marching orders from a small fringe of their minority party. They're all Ted Cruz. One every-other-day of the new Congress from POTUS who demands "a better politics." MT @markknoller: Make that 13 veto threats.